Ensign Jacob Black had spent most of his life on starships and space stations. He'd enjoyed holodeck excursions camping in Yosemite on Earth and hiking the hinterlands on Bajor. His father had also taken the entire family to programs set to recreate the forests near his ancestor's home in Scotland. No one could have prepared him for the reality of London in 1888. Specifically, no one could have prepared him for the smell. The Thames was subject to the tides of Earth's large moon; when the river went down, all manner of noxious matter came up. The streets were dirty in the Whitechapel district, but the alleyway he was standing in was worse than usual. He wasn't too far from a public house, and the stones beneath his feet had apparently absorbed the smell of sour stomach, human waste and spilled ale. Starships didn't smell like this. Jacob ducked further into the itchy wool scarf he wore and tried to focus on the job at hand before his inattention was noticed. Black winced. Of course Walker would notice. Somehow. "Nothing so far, Captain. Our local contact has done an excellent job making inquiries, but there’s no sign of our Na’kuhl." "Keep an eye out. We know the last attack happens tonight." Black grimaced and pretended to take a sip of a drink purchased at the local pub. "I know we can't interfere, sir, but," he trailed off. "I know," Walker sighed over the commlink. "I put the pictures of the victims into the briefing on the Ripper entity, remember? I’ve seen what this thing can do. It’s a piece of history I’d gladly erase, if I could. Try to focus on the reason we’re here. It helps." Black nodded silently, turning his thoughts to that very reason. Reports of a “red eyed demon” had been dismissed by authorities of this time period. Scant mention remained in the surviving papers hundreds of years later. But there was evidence – photos, in this case, showing a Na’kuhl woman lurking in the background of a crowd of onlookers, an alien witness to grisly events. Walker wanted to ensure that the Na’kuhl wasn’t directing the actions of the Ripper, and so Jacob Black walked the streets of Whitechapel seeking an unwelcome visitor from the future. The fog brought the smell of the fetid river with it as it filled the area. Visibility dropped and Jacob silently cursed the need to blend in – no futuristic tech or vision enhancers could be seen by the locals. Space stations didn't have fog. As much as Jacob disliked his surroundings, he still had a job to do. History recorded the entity had been operating independently at the time of its demise and it was his job to see that timeline assured. If the Na’kuhl had a hold over the Ripper entity, it had to be broken before the night’s end, lest the two slip away into history to cause more damage. "What I wouldn't give for a proper tricorder," he mused. Walker chuckled. "We're stuck with the good ole mark-one eyeball." "This fog is just as thick as the stories said it would be -" he broke off as the rattle of stone on stone sounded nearby. "Hold," he said, keeping his voice low. He muted the line and turned away from the relative brightness of the street to creep further down the alleyway. Were those footsteps ahead? The fog was thick enough it muffled sound. Nothing sounded quite like it did in a climate controlled area. Nothing sounded "right" to him at all. London was alive in ways that a holodeck couldn't really capture. Gone was the ever-present hum of a warp core, the gentle susurration of wonderfully clean air through vents, or the soft chimes of the computer system. Instead he could hear yowling cats, doxies advertising their wares, and the cadence of hooves on cobblestone. The raucous laughter from the pub ebbed and flowed like the tides as the doors opened and closed. Jacob paused and listened. Was a stone what he had heard? He paused and strained to hear. Was that a footstep? A stray dog? The alleyway was dark and he knew there was a hunter in the night. He wasn't too far from where Mary Jane Kelly was destined to die - if she wasn't already dead. The Ripper would kill her, brutally. History had recorded her death, and as much as Jacob found it to be sad and frustrating, there was nothing he could do to alter her fate. 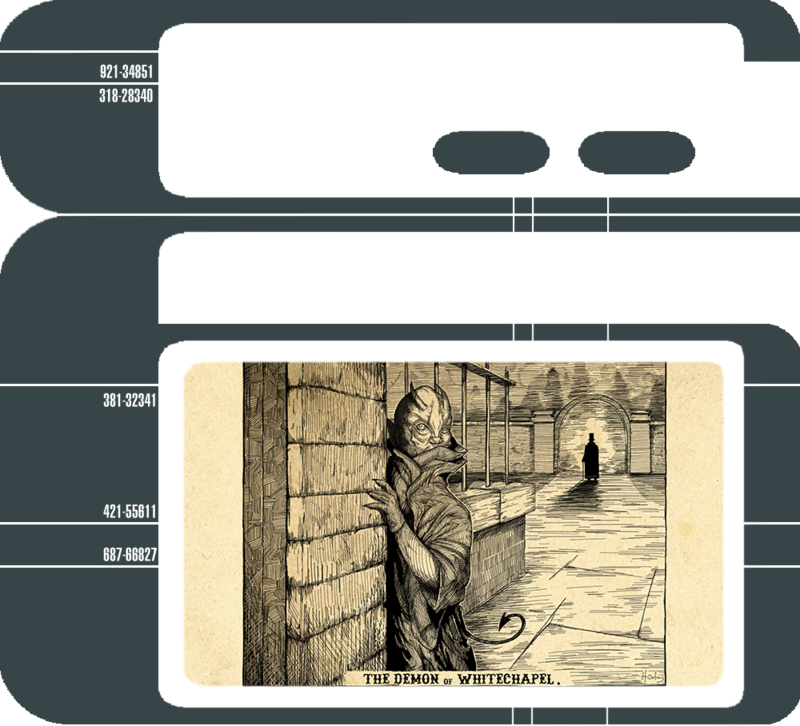 History had scant record of the Ripper between that attack and the time it attached itself to a city administrator on Argelius II in 2267, but they knew more than the Enterprise crew had when they’d destroyed it. "Stay sharp. There’s at least one dangerous killer in that area, and it might have a trained Na’kuhl operative for company." Jacob nodded, though he knew the captain couldn't see. "Acknowledged." He continued his careful creep, placing his feet so he wouldn’t make noise. If someone saw him, he'd look suspicious, but the fog that filled the area did a good job of concealing him. Among others, he thought grimly. The alleyway wound into a back court. The only light was what spilled between shutters and curtains, all muted by the heavy fog. It was an area marked with extreme poverty, judging by the trash and meager lodgings. Jacob's boot hit a broken piece of wood and sent it careening down the cobblestones, the sound surprisingly sharp in the darkness. It echoed strangely through the fog. Jacob froze and tried to ignore the bounding of his heart. He tried to hear anything from inside the fog-filled darkness, but all that came to him was silence, or near to it. Breathing a sigh of relief, he crossed the court and into another alleyway. This one was partially covered, as the apartments had apparently decided to expand outwards. Though it was relatively dry, Jacob didn't see any hunched figures trying to sleep through the cold, wet night. That wasn't surprising given that “Jack the Ripper” was stalking the streets of Whitechapel, and anyone who was able had left the area - even if it meant they might be arrested for vagrancy elsewhere. The creature, his briefing told him, thrived on fear, eating it and the other negative emotions it could generate by brutal kills. Black didn’t need to be an empath to sense the feeling of terror in Whitechapel; it was about as thick as the fog. Again, Jacob thought he heard footsteps in the distance. He paused by a suspiciously large pile of trash as a soft rustle attracted his notice. Something was moving. With careful, silent steps he approached the shadows, his weapon drawn. He paused, then stepped forward a few more steps. Whatever it was, it was large. "It feeds on fear," he reminded himself as he crept closer. "Don't be afraid." Jacob moved through the night with only a pounding heart and his own wits for company. The rustling stopped. Jacob swallowed. The silent moment stretched taut like a wire, then snapped. With a yowl, a cat leapt from the trash and streaked away. Jacob cried out in surprise and hopped out of the way of the startled feline. Just a dumb cat. He huffed out a breath and re-holstered his weapon. "Just a cat, sir," Jacob said. He turned to find a fist heading for his face. Ducking out of the way he deflected the second blow automatically, grateful for the security training. The man's eyes were wide; the whites glittered in the low light. The expression on his face was an intense sneer. He followed up the wide swing with a stab of the long knife he held. Jacob deflected the second attack. His coat only looked period appropriate. The under-layers were made of material that could stop most weapons of the era; weapons like the knife preferred by the Ripper entity. Jacob backed up to get some distance between him and his attacker. Footsteps to his left drew his attention. In the shadows, the red eyes of a Na’kuhl considered him with gleeful malice. "And here I thought we might be able to proceed without incident after the first five test runs were so smooth." Her smile was vicious. "Attack," she ordered, addressing the possessed man near Jacob. The knife split the air as it stabbed towards Jacob. Turning, he tried to draw his weapon again. The coat got in his way and he ended up having to dance away from the man with the knife. Jacob snatched a piece of wood from the trash pile, figuring that some weapon was better than none at all. "The team is converging on your position!" "It would be great if they could hurry!" Jacob said, using his makeshift club to knock aside another stabbing thrust. Wood splintered off as the blade struck. Behind his possessed foe, the Na’kuhl was slowly advancing, her steps casual. She carried a datapad in one hand and appeared to be amused by the situation. Jacob turned and fled, hoping his team would be able to see where he was going. The heavy footfalls of the Ripper pursued him. He leapt over more trash and dashed through a courtyard and into the fog-filled street. The pub's door opened and Jacob frowned. Too many bystanders and the Ripper was still following. Crossing to the other side, Jacob ducked into the first dark alleyway he saw. And hit a dead end. Jacob turned and met the Ripper. He broke the piece of wood over the man's head as he closed in, stunning him. Jacob backed off, drew his weapon and shot the Ripper. There was pure fury in the man's eyes and it took a second shot to drop him. Breathing heavily, Jacob approached cautiously and checked the man's pulse. Jacob looked up as the Na'kuhl regarded him from the end of the alleyway. "I expected this one to last longer. Oh well. Order start: Change host." Jacob had only a split second to understand what her words meant when a hand like an iron vice gripped his arm and hauled him down. He stared into the mad eyes of the man who'd been chasing him and suddenly felt a restless need deep in his soul. He needed to rise, to attack this lesser being that seemed to think it had control. He needed to carve her flesh as he had the other weak prey on this pathetic planet. He was an ambush predator, and the lesser thing had forced him to walk in the light among the prey. It was insulting. "Good," She mused, smirking. "Take up the blade and dispatch the old host." The Ripper did as it was instructed. It turned to the red-eyed one that called itself Na’kuhl, knife in hand, and approached. "I wonder what mischief you can get into inside the body of that temporal agent,” she purred. “There could be some justice in this. For now, let’s make our way back to the ship. This was a successful test run, and I have a list of targets half a parsec wide for you." Her red eyes grew comically large as the knife sliced her open. Yellow blood dropped to the pavement like fat drops of rain. Oh, her fear was delicious. It rolled off her in glorious waves and the Ripper felt strength returning. It reveled in her fear, for it was so much better than what came before. It was terror birthed by the shock of predator becoming prey. The Ripper made the new host's expression a sneer as it withdrew the knife and slashed it across the throat of its former mistress. It drank the last ebb of fear as the body fell to the ground in a lifeless heap. It turned and saw what was unmistakably a weapon pointed at the host. The beam hit the host's chest, and the host collapsed. The entity hid in the recesses of the host’s mind, waiting for its next opportunity. Walker sighed as he watched the young man struggle to recall anything which the Na’kuhl operative had told him before the Ripper entity took over and killed her. "No," Captain Walker said, shaking his head. "Damn. What were they thinking, trying to contain a monster like that?" "If I had to guess, I'd say our supposition that it was carrying out targeted assassinations is the most likely option. What's the word on the Lieutenant?" "Damn. I thought with so much history unaccounted for we might have better luck." Walker sighed. This was one of the worst parts of his job. The entity had to return to the timestream with its host. History was not yet done with the Ripper. "There is some relief in knowing that eventually this creature will be atomized. As much as I would like to do it now, history records that I'm not the one who does it,” Nereda growled. "I just wish it didn't mean the death of one of my people," Walker said. "I guess we know how the Entity got off Earth in 1888." Lieutenant Black would be left elsewhere, elsewhen, matching the data they had on the entity’s movements across the galaxy. Jacob would be marooned in time to ensure events unfolded as they were supposed to. "Does he know?" Nereda asked. Walker looked across the medical bay where the lieutenant was patiently answering questions behind a quarantine field. Their eyes met and Lieutenant Jacob Black nodded slightly to the Captain before looking back at the nurse. "He knows," Walker said. "And we'll remember his sacrifice." The life of a Temporal Agent will take you across time and space to strange frontiers and deadly battlegrounds with the Temporal Agent Pack.